Distinguished by his eclectic yet balanced designs, Erick Millan is an acclaimed architect specialized in interior design and styling. As a true believer in Maximalism, he does not deliver spaces but rather complete sensorial experiences achieved by his capacity to mix colors, textures, & patterns along various elements of nature in a harmonious way. To embody Erick's Maximalist profile, and the prominence of nature in his projects through a memorable graphic concept. We developed an identity that reflects the designer's personality. Given the typographical selection, the logo maintains a classic tone. 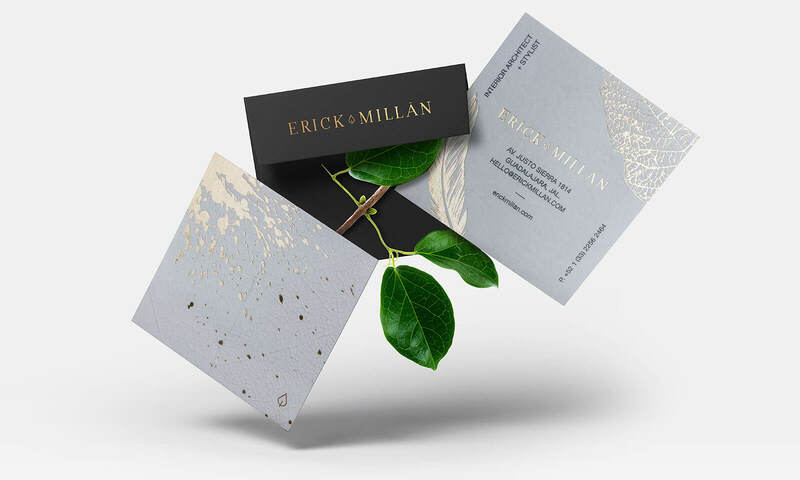 The icon that comes with it makes reference to a leaf, and seeks to expose the critical role played by nature in Erick's designs. Same concept that prevails in the stationary, which includes a handmade illustration. Details in gold and techniques such as Hot Stamping add a touch of elegance.